Troops loyal to illegitimate socialist dictator Nicolás Maduro violently drove back foreign aid convoys from Venezuela’s border crossings on Feb. 23, drawing condemnation from the United States, and prompting interim President Juan Guaidó to propose that the international community consider “all options” to secure the impoverished nation’s freedom. Maduro’s troops set fire to two trucks laden with food and medicine, and forced others to return to warehouses in Colombia, after Guaidó’s citizen volunteers failed to break through the blockade. Troops dispersed crowds at several border crossings and towns with live rounds, tear gas, and rubber pellets, killing two protesters and injuring hundreds. Rights group Penal Forum said it recorded 29 injuries from bullet wounds and two deaths across Venezuela in clashes with troops on Feb. 23. Colombian authorities said they registered 285 people injured, including those affected by tear gas. The United States was the first to recognize Guaidó as the legitimate leader, when he invoked the constitution to assume an interim presidency last month. More than 50 free-world nations now recognize Guaidó, while a handful of current and former communist and socialist regimes back Maduro. President Donald Trump has warned members of the Venezuelan military that they stand to lose everything if they harm fellow citizens and continue to side with Maduro. Trump also has said that military intervention is one of the options on the table. Guaidó had given a personal send-off to one convoy carrying aid from the Colombian city of Cucuta on Feb. 23. Guaidó’s volunteers hoped Maduro’s troops would balk at turning back supplies desperately needed in the country, where millions suffer from malnutrition and treatable diseases. Some 60 members of Maduro’s armed forces defected Feb. 23, according to Colombian authorities. But the lines of National Guard soldiers at the several border crossings held firm, and fired tear gas and rubber pellets at the convoys. Television images from one border crossing showed an all-female unit of Maduro’s forces locking arms to block the aid convoy. Some of the women appeared to break down in tears as volunteers begged them to allow the aid to proceed. Maduro’s forces set two aid trucks on fire at the Urena border point, sending plumes of dark smoke into the air as crowds raced to try to save the boxes of supplies. Guaidó said he would attend a meeting of the regional Lima Group of nations in Bogota on Feb. 25 with U.S. Vice President Mike Pence, and they would decide on more actions to ramp up pressure on Maduro. “Today the world saw in minutes, in hours, the worst face of the Venezuelan dictatorship,” Guaidó said at an earlier news conference in Colombia, alongside Colombian President Ivan Duque. Angered by Duque’s support for Guaidó, Maduro said he was breaking diplomatic relations with Bogota and gave its diplomatic staff 24 hours to leave the country. Maduro, whose socialist policies have crippled the once oil-rich nation, denies his nation has any need for aid. Washington has warned it could seek to impose tough new sanctions on Venezuela at the Feb. 25 summit if Maduro blocked the aid shipments. Witnesses said masked men in civilian clothes also shot at protesters with live bullets. Pompeo noted that the attacks were perpetrated by Cuban agents on behalf of Maduro. In a thinly veiled rebuke to China and Russia, Bolton asked how these countries could back such behavior. The United States considers Maduro a puppet of the communist regime in Cuba. More than 90,000 Cuban proxies are embedded in Maduro’s government. The communists in Havana have also deployed more than 20,000 security-force personnel to Venezuela to support Maduro. Television images from San Antonio showed a dozen men on motorbikes, dressed in black and wearing balaclavas, firing shotguns and pistols at a crowd. Demonstrators in Urena barricaded streets with burning tires, set a bus on fire and hurled stones at troops to demand that Maduro allow aid into a country ravaged by a meltdown that has halved the size of its economy in five years. At least six of about a dozen trucks that tried to reach Venezuela later returned to Cucuta, where Colombia’s disaster management agency said they would be unloaded and the aid stored until Guaidó requested their use again. Puerto Rico Gov. Ricardo Rossello said he ordered a Puerto Rican ship carrying humanitarian aid to turn back after a Venezuelan navy ship threatened to open fire on it. In the southern town of Santa Elena de Uairen, at least two people were killed in clashes with security forces, according to a doctor at the hospital where they were treated. On Feb. 22, a married couple in a nearby indigenous community was shot dead by security forces. Guaidó had appealed to Venezuela’s armed forces to stand aside and allow aid in, promising amnesty to officers who disavowed Maduro. Dozens of soldiers, whose families suffer the same shortages as other Venezuelans, took up his offer. 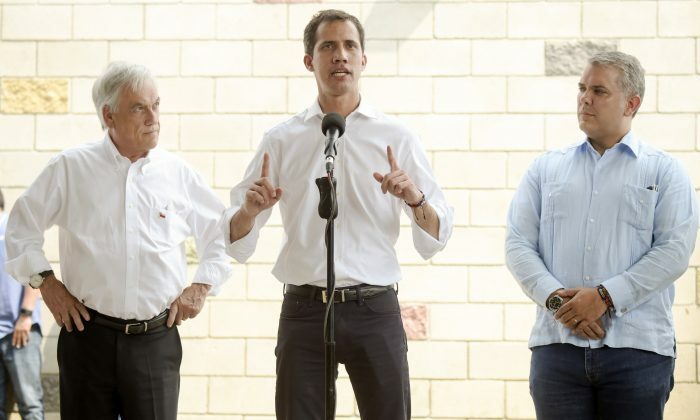 “You don’t owe any obedience to someone who sadistically celebrates that humanitarian aid doesn’t enter a country that needs it,” Guaidó said. A video on social media showed troops who abandoned their posts driving armored vehicles across a bridge linking Venezuela and Colombia, knocking over metal barricades, and then jumping out of the vehicles and running to the Colombian side. Three U.S. military cargo planes touched down in the Colombian border city of Cúcuta, carrying aid for Venezuela. Thousands attending a concert to raise money for Venezuela’s humanitarian crisis at the Colombian border on Feb. 22 were surprised by the appearance of Juan Guaidó.